Get ready to dance your heart out as a month-long dance festival just landed at Bluewaters island. 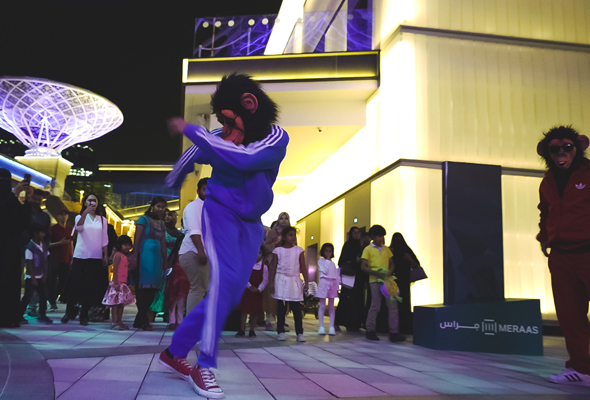 Found off The Beach, JBR, the new destination is hosting an array of free workshops, activations and entertainment to have you shaking your stuff all through April. There’ll be an array of activations for dance fans of all ages, that will run every Thursday, Friday and Saturday until April 27. Thursdays are dedicated to a weekly movie night that will take place on the ‘Wonder Stage’ at 8pm. The dance-themed films will be different each week, with Hairspray scheduled for Thursday April 11, followed by Footloose on Thursday April 18 and closing with La La Land on Thursday April 25. On Fridays, try your hand (or feet!) at an hour-long dance workshop, that will take place in the dance zone. Whether you fancy yourself as a tap dancer, or you’re looking to learn some killer hip-hop moves, the workshops are all free to attend and lead by trained professionals. Sessions will take place every Friday at 4pm and 7pm. Saturday is your last chance of the week to get involved in a dance workshop, with a session at 4pm every weekend. Then, head to the Wonder Stage from 8pm and be entertained by an open-mic night of local talents singing an array of hits as you wind down the weekend. If you’re feeling peckish after all that dancing, choose from an array of restaurants available on Bluewaters that are sure to satisfy even the pickiest of eaters.